A Note about 7 segment LED display. 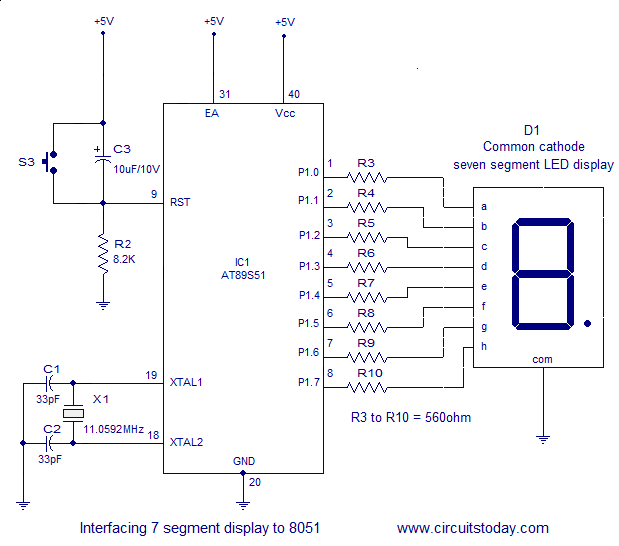 This article is about how to interface a seven segment LED display to an 8051 microcontroller. 7 segment LED display isÂ very popular and it can display digits from 0 to 9 and quite a few characters like A, b, C, ., H, E, e, F, n, o,t,u,y, etc. Knowledge about how to interface a seven segment display to a micro controller is very essential in designing embedded systems. A seven segment display consists of seven LEDs arranged in the form of a squarish ‘8’ slightly inclined to the right and a single LED as the dot character. Different characters can be displayed by selectively glowing the required LED segments. Seven segment displays are of two types, common cathode and common anode. In common cathode type , the cathode of all LEDs are tied together to a single terminal which is usually labeled as ‘com‘ Â and the anode of all LEDs are left alone as individual pins labeled as a, b, c, d, e, f, g & Â h (or dot) . In common anode type, the anode of all LEDs are tied together as a single terminal and cathodes are left alone as individual pins. 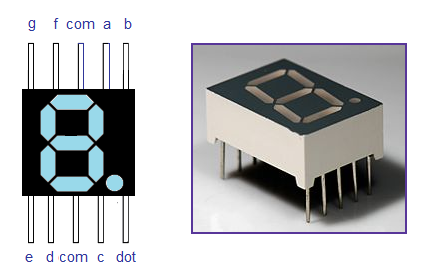 The pin out scheme and picture of a typical 7 segment LED display is shown in the image below. Digit drive pattern of a seven segment LED display is simply the different logic combinations of Â its Â terminals ‘a’ to ‘h‘ in order to display different digits and characters. The common digit drive patterns (0 to 9) of a seven segment display are shown in the table below. Interfacing seven segment display to 8051. The circuit diagram shown above is of an AT89S51 microcontroller based 0 to 9 counter which has a 7 segment LED display interfaced to it in order to display the count. Â This simple circuit illustrates two things. How to setup simple 0 to 9 up counter using 8051 and more importantly how to interface a seven segment LED display to Â 8051 in order to display a particular result. The common cathode seven segment display D1 is connected to the Port 1 of the microcontroller (AT89S51) as shown in the circuit diagram. R3 to R10 are current limiting resistors. S3 is the reset switch and R2,C3 forms a debouncing circuitry. C1, C2 and X1 are related to the clock circuit. The software part of the project has to do the following tasks. Form a 0 to 9 counter with a predetermined delay (around 1/2 second here). Convert the current count into digit drive pattern. Put the current digit drive pattern into a port for displaying. All the above said tasks are accomplished by the program given below. MOV A,R0 // R0 moved to accumulator to check if it is zero in next instruction. JZ START //Checks accumulator for zero and jumps to START. Done to check if counting has been finished. Instruction MOVC A,@A+PC is the instruction that Â produces the required digit drive pattern for the display. Execution of this instruction will add the value in the accumulator A with the content of the program counter(address of the next instruction) and will move the data present in the resultant address to A. After this the program resumes from the line after MOVC A,@A+PC. In the program, Â initial value in A is 00001001B. Execution of Â MOVC A,@A+PC Â will add oooo1001B to the content Â in PC ( address of next instruction). The result Â will be the address of label DB 3FH (line15) and the data present in this address ie 3FH (digit drive pattern for 0) gets moved into the accumulator. Moving this pattern in the accumulator to Port 1 will display 0 which is the first count. At the next count, value in A will advance to 00001010 and after the execution of Â MOVC A,@+PC Â ,the value in A will be 06H which is the digit drive pattern for 1 and this will display 1 which is the next count Â and this cycle gets repeated for subsequent counts. The reason why accumulator is loaded with 00001001B (9 in decimal) initially Â is that the instructions from line 9 to line 15 consumes 9 bytes in total. The lines 15 to 24 in the program which starts with label DB can be called as a Look Up Table (LUT). label DB is known as Define Byte – which defines a byte. This table defines the digit drive patterns for 7 segment display as bytes (in hex format). MOVC operator fetches the byte from this table based on the result of adding PC and contents in the accumulator. Register B is used as a temporary storage of the initial value of the accumulator and the subsequent increments made to accumulator to fetch each digit drive pattern one by one from the look up table(LUT). Note:- In line 6, Accumulator is incremented by 1 each time (each loop iteration) to select the next digit drive pattern. Since MOVC operator uses the value in A to fetch the digit drive pattern from LUT, value in ACC has to be incremented/manipulated accordingly. The digit drive patterns are arranged consecutively in LUT. Register R0 is used as a counter Â which counts from 10 down to 0. This ensures that digits from o to 9 are continuously displayed in the 7 segment LED. You may note lines 4, 11, 12, and 13 in the above program. Line 4 initializes R0 to 10 (OAh). When the program counter reaches line 11 for the first time, 7 segment LED has already displayed 0. So we can reduce one count and that is why we have written DEC Ro. We need to continuously check if R0 has reached full count (that is 0). In order to do that lines 12 and 13 are used. We move R0 to accumulator and then use the Jump if Zero (JZ) instruction to check if accumulator has reached zero. If Acc=0, then we makes the program to jump to START (initial state) and hence we restart the 7 segment LED to display from 0 to 9 again. If Acc not equal to zero, we continue the program to display the next digit (check line 14). Multiplexing 7 segment display to 8051. Suppose you need a three digit display connected to the 8051. Each 7 segment display have 8 pins and so a total amount of 24 pins are to the connected to the microcontroller and there will be only 8 pins left with the microcontroller for other input output applications. Also the maximum number of displays that can be connected to the 8051 is limited to 4 because 8051 has only 4 ports. More over three 3 displays will be ON always and this consumes a considerable amount of power. All these problems associated with the straight forward method can be solved by Â multiplexing . Fewer number of port pins are required . More number of display units can be interfaced (maximum 24). The circuit diagram for multiplexing 2 seven segment displays to the 8051 is shown below. When assembled and powered on, the circuit will display the number ’16’ and let us see how it is done. Initially the first display is activated by making Â P3.0 highÂ and then digit drive pattern for “1” is loaded to Â the Port 1. This will make the first display to show “1”. In the mean time P3.1 will be low and so do the second display will be OFF. This condition is maintained for around 1ms and then P3.0 is made low. Now both displays will be OFF. Then the second display is activated by making P3.1 high and then the digit drive pattern for “6” is loaded to the port 1. This will make the second display to show “6”. In the mean time P3.0 will be low and so the second display will be OFF. Â This condition is maintained for another 1ms and then port 3.1 is made low. This cycle is repeated and due to the persistence of vision you will feel it as “16”. Transistor Q1 drives the first display (D1) and transistor Q2 drives the second display (D2). R11 and R12 are the base current limiting resistors of Q1 and Q2. The purpose of other components are explained in the first circuit. MOV R6,#1H // stores "1"
MOV R7,#6H // stores "6"
ACALL DISPLAY // calls the display sub routine for getting the pattern for "1"
ACALL DISPLAY // calls the display sub routine for getting the pattern for "2"
Got any doubts/questions? Ask here in comments! can you post c code for the same with interrupt routine.. please..!! Is this assembler code for the programs? what is the code to display one digit on 7 segment display and increment in it after delay of 5 seconeds?? shouldn’t we use a transistor for each LED? I mean why you only used transistors in common pins not also in other (8) pins? In the article, the part where it says “This will make the second display to show â€œ6â€. In the mean time P3.0 will be low and so the second display will be OFF. ” … it should be the first display will be OFF, not second display. I am a college student who is practicing 8051 with assembly language. I am new for both the component and program. The program I wrote counts up and down using button. But the button count down after it finishes up counting. I want it to count up when I press up button and down when I press down button. My program is as follows. Would you please help me by showing me how to write. p2.0-p2.7 for counting and p3.0 for up button and p3.1 for down button. you had the chance to create your very own Digital Watch With Countdown Timer. A dolabriform to use cure you would like having. Nice one Sir . But do u have a C / C++ Code for the first circuit ( not the multiplexing one ) . Or anybody ?? Its very good explanation of the seven segment Display. Pls highlight how the said Programme is Burnt and loaded in the controller 8051 in Hex Code. i want to make seven segment based digital clock using 8051 microcontroller,i have no program for circuit , can i get that?? What about a code to multiplexed 7 segment display that counts to FF in HEX? forgot ta add….the up and down counting should be on respective keypress. Hey, can anyone pls help me with a code for 8051 wherein i can count up and down upto 5 digits, and the display is to be on 5 multiplexed seven-segments. This was very usefull for me. And i want to know if i want to count down any where when the above program will be running. i will be using external interrupt for this to interrupt the micro controller to do count down task and it will down count up to zero then it should stop counting. thankx alot for your detailed lecture. please sir, how do i cascade or multiplex or interface up to eight displays to one micro-controller to display an “eight-lettered” word, i need the circuit arrangement and program. Thankx and God bless. 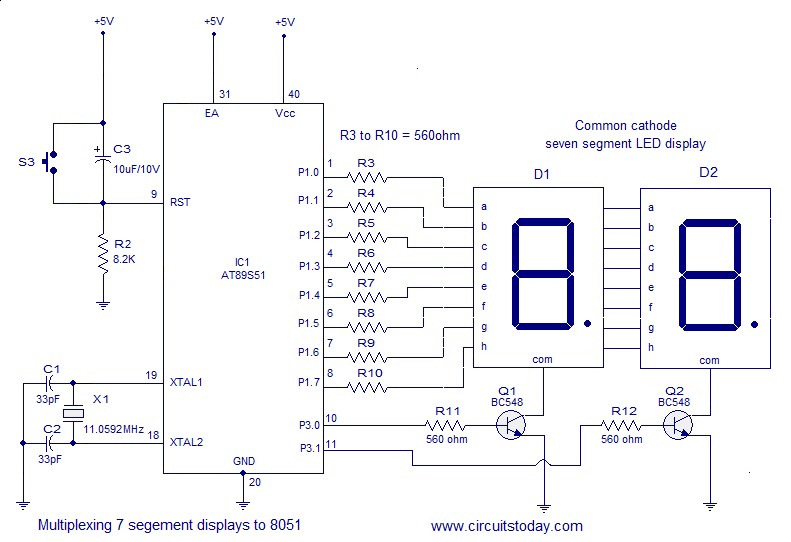 sir, how to display the all the 7 segement LED at a time sir…? i need to blink all the four 7segment led all of once. I wants to know weather micro controller would be able to drive Seven segment display. It has source current in micro Amp. i use 4094b with common cathod fnd to 8051 #11010010B ;210D d2h for 4h show ,now i want to convert to hex so pleas help me as asm idia . how to print 1 to 24 on seven segment display. here two switchs are there. first one is 1 to 24 print. (when ever this pin is press). second is number selection pin(when ever this pin is press). thank you sir for great description! I have edited the code snippet due to its length! However the error can be due to a reference to an undefined variable in the program. Just read through you codes twice to spot an undefined variable/constant. In interfacing 7 sdgment 8051,there are some one are earthed.what this exactly do? Thanks sir the way of writting the article is awesome,thinge become pretty much easy after studying the articles.The articles have their practical side of own. Hello Ashwani, Thanks for the nice words. Keep looking for more articles. dear sir, i dont understand very well the mova a,@a+pc, when the program is in this line, the pc is with value of 0bh, with the acc, will be 0bh+0aH = 15h, the db=3fh is in the 15h position? tks! i want to make a led display board which shows digits that are pressed on a tv remote .please guide..
fr tht u hav to intrface wit the keypad as well as seven segment. @namgvaerarak – Logically it should work. I haven’t seen any errors in particular. it will work, i guess. I have used edsim51 simulator to learn this module\run the program. But I have a faced a problem,in that simulator the 2’s compliment of the instruction DB 3F i.e DB C0 has to be written for getting the the display for 0.That means for the L.E.D to glow 0 has to be given to the respective pin not 1. Is it the fault of simulator or Is it my fault? we have tested the circuit in real environment. different simulators have different specifications and you have to adjust the code accordingly. Okay anyway thanks for the response.. 🙂 Waiting for more posts on microcontroller. If you have Multisim software then please check out this file..
Sir i use NI Multisim 11.0 software to built these circuits in my PC. But when i checked this circuit in Multisim software it is not working. The seven segment is not displaying me the numbers. But the assembler results is showing zero errors and zero warnings. I want to know weather it is software fault or the circuit fault. If it is the software fault then please recommend me some software to build circuits like these. @shrihari rao – We tested this circuit in a real environment. We have not used any simulators to test software/circuit. So I cant tell exactly which part is causing the problem. @shrihari -We have tested this circuit here in our lab. It worked really fine. The program we developed is perfect. Please tell what’s the problem you face?? Please see this.. Help me..